If WBC heavyweight champion Bermane Stiverne gets past the formidable Deontay Wilder tonight in their fight at the MGM Grand in Las Vegas, Nevada, Stiverne’s promoter Don King is reportedly interested in matching the 36-year-old Stiverne up with unbeaten heavyweight contender Tyson Fury in a fight that could take place in the UK if Fury accepts the fight. 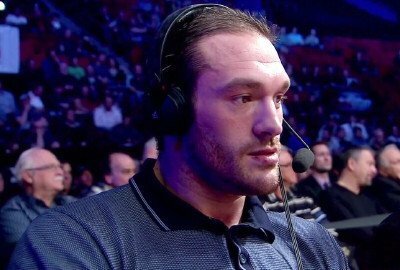 There are obviously a lot of ifs involved, because it would require not only a win by Stiverne tonight, and he’s no lock to beat Deontay, but it would also require for Fury to choose not to face heavyweight champion Wladimir Klitschko. Fury is Wladimir’s WBO mandatory challenger after he stopped Dereck Chisora recently in a 10th round stoppage in their WBO heavyweight eliminator bout. If King makes a better off than what Fury will be getting for a fight against Wladimir, then it’s definitely a possibility to get Fury to take the Stiverne fight. However, a fight against Wladimir would give Fury a nice payday, and he might not want to turn that big payday down unless King makes him an offer he can’t refuse. Fury would likely have a much better chance at winning a world title against a short fighter like Stiverne than he would against the 6’6” Wladimir or Deontay Wilder. Stiverne is very similar to Dereck Chisora in terms of size, build and fighting style. It’s a style that Fury could easily solve with his huge size and reach advantage. Fury will be back in the ring next month in a stay busy fight against fringe contender Christian Hammer on February 28th at the O2 Arena in London, UK. Wladimir will be defending his titles on April 25th against likely opponent Bryant Jennings.